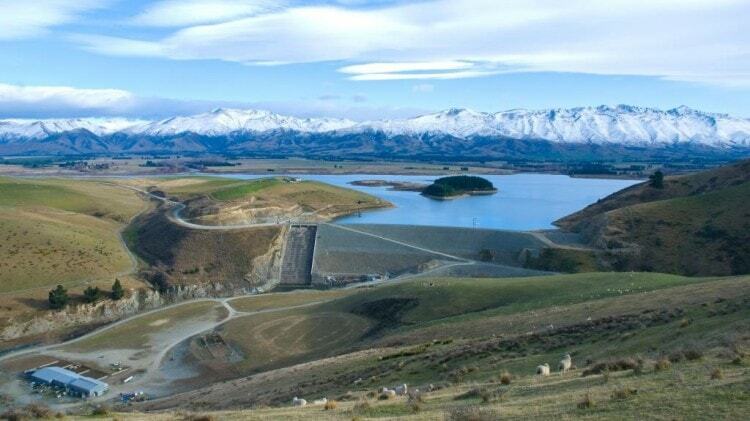 The Opuha Dam, which is situated at the confluence of the North and South Opuha Rivers 17 kms north-east of Fairlie, is an infrastructure project undertaken by the community of South Canterbury. The actual project itself consists of a 50 metre high earth dam, with a single hydro turbine and a lake covering up to 710 hectares and storing over 74 million cubic metres of water. The lake provides water to maintain environmental flows in the downstream catchment and for irrigation as well as urban and industrial supplies. Renewable hydro electricity is generated with all the water released from the dam. Water storage is prioritised for release into the Opuha River which flows into Opihi River to ensure minimum flows are maintained at all times and especially in times of drought and/or low natural flows. Initially, the concept came out of discussions between the Electricity Corporation of New Zealand (ECNZ) and the Opihi Augmentation Society, and resulted in the Opuha Dam Partnership being formed back in 1992 to commercialise the project. At this time, it enjoyed the support of local Lines Company, Alpine Energy Ltd, Timaru and MacKenzie District Councils, the Opihi River Development Company and two irrigation companies – Levels Plain Irrigation Company Ltd (which existed prior to the dam) and South Canterbury Farmers Irrigation Society (SCFIS) which was established to represent the farmers who would in future be able to access water from the dam. Construction of the dam began in 1995 and progressed very successfully until Waitangi Day 1997 when three days of solid rain in the upper catchment resulted in the partially completed dam being overwhelmed and breached by the high inflows. While there was extensive damage downstream and to the construction site, the project faced only a temporary set back. Repairs were swiftly completed and the project was commissioned and officially opened in November 1998. After nearly ten years of initial operation, the scheme was purchased outright by the farmer irrigators who are now 100% shareholders of the ownership company Opuha Water Ltd. The project has been immensely successful for the economic prosperity of the region and has enabled the development of a robust agricultural sector covering a wide range of land use activities. These include dairying, horticulture and arable cropping, sheep, beef and deer and specialist seed growing. These on-farm activities support significant downstream industries such as the vegetable processing facilities at Washdyke, dairy processing and represent a significant part of the region’s export economy and earnings. The lake itself provides excellent amenity value, especially for the local Fairlie community where the lake provides recreational benefits which people from Timaru and Ashburton also come to enjoy. The lake is an increasingly popular destination for the region’s schools as part of their rowing and water based activities and programmes. The Opihi catchment is experiencing the same challenges as most freshwater catchments in Canterbury with concerns over the reducing water quality of the rivers and streams and the impacts this has had on amenity value and in-stream aspects including the fishery. While the dam has resulted in better river flows being maintained throughout the year with positive results such as maintaining the river mouth opening, understanding the impact of the dam on water quality and what improvements may be able to be made continues to be a focus for Opuha Water Limited.